Honor your strength and determination to fight and beat leukemia each time you wear our Leukemia Survivor Ribbon Hat. Each time this inspiring Survivor Hat is worn, you will be giving hope and courage to people fighting this disease. Every person deserves a chance and helping spread awareness is one step closer to finding the cure. 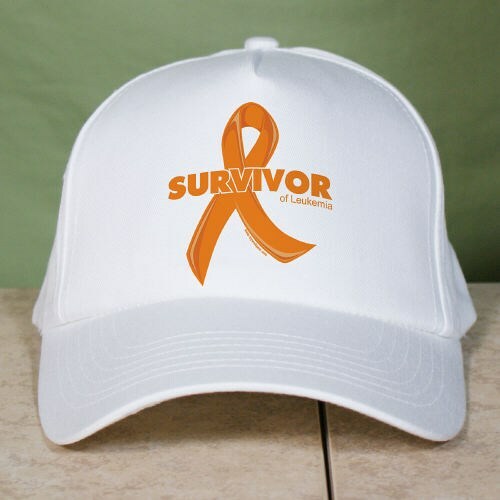 Our Leukemia Survivor Ribbon Hat is printed on our premium white cotton/poly Hat with adjustable back strap for a one size fits all. Additional Info Each person with leukemia deserves a fighting chance. That is why MyWalkGear.com has created an inspirational collection of Leukemia Awareness Shirts and Gear that help show your support and determination in finding a cure. By showing the world you’re a survivor, you’ll be giving individuals and families all over the world the hope they need. Along with this inspiring hat, you can also show you’re a survivor with our Leukemia Survivor Ribbon Key Chain and our Leukemia Survivor Ribbon Sweatshirt as well.